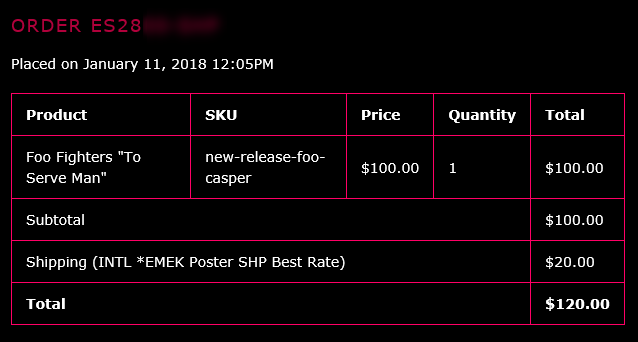 Emek A/P's for the Casper show go on sale Thursday at around 12pm PST, for reference that is 8pm UK time. Indeed they will be. $100 a piece. I have a few from this cycle but this is the only poster I have felt I absolutely HAD to have - so this made me very happy - I had the refreshed order page showing a second after it hadn't been there at 12.04, had Paypal ready & logged in and was completed in 20-30 seconds or so. Refreshed immediately and they had already all sold out. 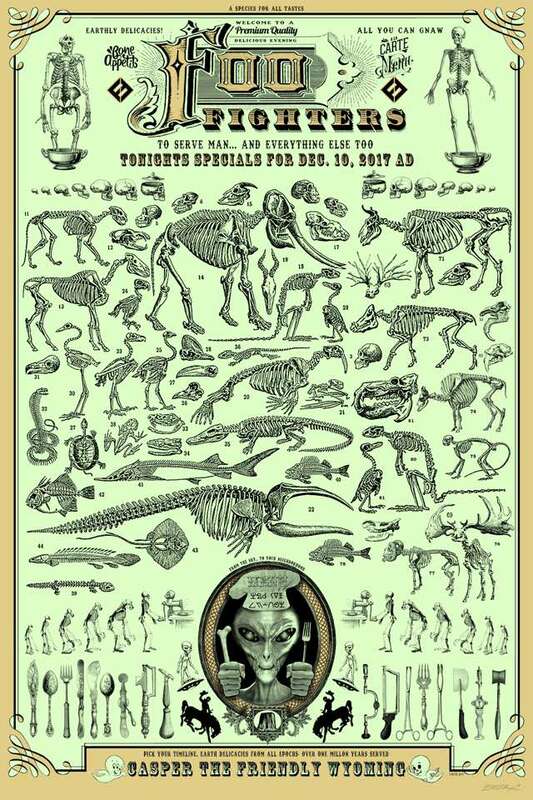 Foo Fighters is an old-timey term for UFOS… and this poster is meant to look old-timey as well. The chef's hat says “to serve man” in the original Twilight Zone alien language. Casper Wyoming has a lot of fossils, and cattle, and is near the famous “devils tower” mountain from the movie "Close Encounters of the Third Kind"
On sale at www.emekstudios.com click on the NEW RELEASE image to open the sale page. The BUY NOW buttons will appear sometime between 12:00pm and 12:15pm PT on Thursday Jan. 11th. Foo Fighters "To Serve Man"
A limited edition poster of 350 (made for the Casper, Wyoming show) printed with Metallic ink & Glows-In-the-Dark! My release of the remaining 100 are signed, numbered & doodled. Last edited by FooZealand : January 11th 2018 at 08:12 PM. [quote=FooZealand;4183288]I have a few from this cycle but this is the only poster I have felt I absolutely HAD to have - so this made me very happy - I had the refreshed order page showing a second after it hadn't been there at 12.04, had Paypal ready & logged in and was completed in 20-30 seconds or so. Refreshed immediately and they had already all sold out. Nice score! I got one too! I am totally stoked. Super tough to get a copy of any of Emeks’ limited special runs. Like you, I have a couple of posters from this leg of the tour, with this one being my favorite and a foil edition from the Sacramento show coming in at a very close second. Gotta thing for FOO dogs. Ah well, didn't really have the monies for it anyways.. It's interesting he has raised his price to $100 (not right now but over the last 12 months) and the sell price for the flippers is falling simply because there are just SO many posters for so many shows, and then all the artist variant on top of that, meaning collecting everything is neither easy nor financially logical. So with 350 of these total, more gig ones are bound to turn up and they are the same poster just not doodled. * Different number series with "AE"
* Different number series with "AP"
Last one really annoys me as some artists reference AP as meaning "Artist Print" (just a variant of Artist Edition} when AP to me has always mean "Artist Proof" a much rarer run from the initial testing before a main print run is approved.